Happy Wedding Wednesday to you! Although in all honesty, I'm still completely thrown off with what day it is this week - is anyone else? Please tell me I'm not alone...?! New Year's Day falling on a Monday has been quite confusing for my brain, ha! The one thing that is very clear to me though, is how rewarding and wonderful it is to consistently work with such talented teams of wedding vendors in Baltimore and the surrounding areas... our 2nd vendor spotlight (peep the first one here if you missed it!) showcases Blush Floral Design Studio, and owner/designer, Linda Montuori! I feel so lucky to have been introduced to Linda and her stunning work while designing a photoshoot with Courtney of Moore & Co. Event Stylists. As part of the Be More Inspired collective of wedding professionals, Courtney and Linda have worked together many times; as soon as I showed Courtney my vision for the greenery-filled bouquet, she recommended working with Blush... 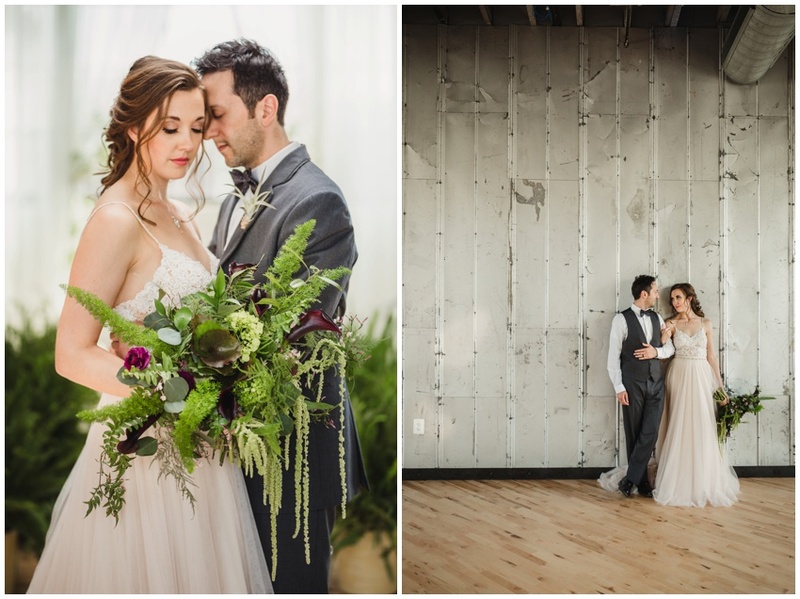 I couldn't be happier and definitely shrieked with excitement when she first showed me a sneak peek of this amazing fern-filled bouquet that simply overflowed with texture and industrial elegance!! What led you to pursue a career in floral design? I started my career in floral design after working in marketing for several years. As most people do at one time or another, I went through a phase of wondering what I wanted to do when I grew up. I always loved visiting local florist shops when traveling through a new town or city. If it had a great window display, I was in! I always felt so inspired seeing unique flowers and designs (and there is nothing like the smell of a floral shop). Eventually, I stopped into my local florist and literally begged for a job. I started out washing buckets, taking orders, and over time, I learned all aspects of running a florist shop. But my world changed when I started designing! I decided to start my floral design business specializing in weddings. After my wedding business started to flourish while working out of my garage studio, I moved my studio into a beautiful building that I now share with other wedding professionals. Every week I meet with amazing couples who put their trust in me to create fabulous floral designs for their wedding! I am truly blessed. I always ask my couples how they met. I find their stories to be fascinating and I definitely believe in fate! Keep it personal! Hire vendors that you trust and then turn it over to them to take the stress off. What are some creative ways couples can stay within their budget when it comes to their wedding florals? My advice is to focus on three floral focal points… the bouquets, a ceremony focal point and your centerpieces. Other elements are great to add but are not a necessity when working on a budget (i.e., bar arrangements, powder room, cocktails etc.). Also, be open and let your floral designer use your Pinterest inspiration as a springboard to a new original interpretation specifically for you. I might see something in a magazine or on Pinterest or in a store that just catches my eye and before long I am in my studio trying to recreate it with my own twist. I love an afternoon with my design staff where I present an idea that is in my head and we try to figure it out. They inspire me! I can’t live without my kindle. I love to read historical fiction! I just finished a great book called Lilac Girls by Martha Hall Kelly, which was inspired by the life of a real world war II heroine. I also enjoy a good love story! Any exciting upcoming projects or collaborations we should be on the lookout for? Looking forward to spring wedding season starting soon! One of my 2017 spring weddings was featured on Artfully Wed in September! Thanks again for sharing your time and talent with us, Linda! I love hearing how a keen interest led you to develop your passion into the successful business it is today and look forward to capturing your florals as part of future Urban Row couples' weddings!! What types of vendors are YOU interested in learning more about? Questions about all the things event designers/planners have a hand in? Looking for an experienced caterer that can accommodate dietary restrictions while still presenting a deliciously unique and memorable menu for you and your guests? Send me an email and let me know the vendor spotlights to focus on moving forward (naomi@urbanrowphoto.com)! I love collaborating and sharing my experiences with the most talented, local Baltimore wedding industry pros I've worked with and meeting new ones to learn from!